Netscape Communications Corporation announces its intention to release the source code of Netscape Communicator 5.0 as open-source. Netscape releases the source code to Netscape Communicator 5.0. MozillaZine goes live, with Chris Nelson at the helm. mozilla.org starts providing precompiled nightly builds. MozillaZine breaks the news that future development will be focused on the NGLayout rendering engine. This marks the beginning of an effort that eventually leads to the majority of the old Communicator code being rewritten. MozillaZine merges with MozBin, bringing Jason Kersey on board. At the same time, MozillaZine takes on a look similar to the one it has today. MozillaZine wins its first award. America Online agrees to purchase Netscape Communications Corporation. Sun Microsystems begins contributing to the Mozilla project. The first Mozilla milestone, M3, is released. MozillaZine reports on the resignation of Jamie "JWZ" Zawinski from Netscape and the Mozilla project. MozillaZine hosts the second contest to find a throbber for Mozilla. Steve Morrison joins the site as the ChromeZone is launched. MozillaZine's IRC channel, #mozillazine, launches. French and Japanese MozillaZine translations launch. Chinese translation of MozillaZine begins. Netscape 6 Preview Release 1 unleashed. First Bug Day on #mozillazine. Second Classic skin in Mozilla nightly builds. It is confirmed that the first non-beta release of Mozilla will be called Mozilla 1.0. German translation of MozillaZine goes live. The new Modern 2.0 theme begins landing. In an editorial, MozillaZine founder Chris Nelson blasts standards advocates for their harsh treatment of Netscape. A blistering response to Jeffrey Zeldman of the Web Standards Project follows the next day. Chris Nelson phases out his involvement with the day-to-day running of MozillaZine. First set of Independent Status Reports arrive. Third major revision of the Modern theme revealed. Chief Lizard Wrangler Mitchell Baker announces that, despite being laid off from Netscape, she will continue to head mozilla.org. Relicensing of the Mozilla codebase begins. The eventual aim is for almost all of the Mozilla code to be tri-licensed under the Mozilla Public License, General Public License and Lesser General Public License. 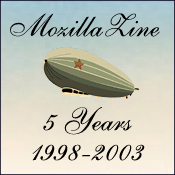 Bandwidth limitations cause MozillaZine to run on a reduced service for several weeks. Many readers donate funds to the site. MozillaZine's newest admin is revealed to be Alex Bishop. After four years, Mozilla 1.0 is finally released. MozillaZine reports on a Chimera release for the first time. Nightly builds of the standalone Phoenix browser available. MozillaZine publishes its first annual Review of the Year. MozillaZine asks its readers to pay the site's hosting fees. Much to our surprise, you do. Due to trademark issues, the Chimera browser for Mac OS X is renamed Camino. The Minotaur project to build a standalone Mozilla-based mail and newsgroups client is officially launched. On the fifth anniversary of the release of the source code, bug 200000 is filed in Bugzilla. MozillaZine breaks the news of Mozilla's new Roadmap, which centers around standalone applications. It is announced that Phoenix and Minotaur will be renamed Firebird and Thunderbird, sparking off the Firebird naming conflict with the Firebird database community. Due to bandwidth issues, the MozillaZine Forums are temporarily taken offline. Mozilla 1.4 released. It is intended to replace Mozilla 1.0 as the stable development branch. mozilla.org launches the non-profit Mozilla Foundation. America Online closes the Netscape browser division, laying off or reassigning the remaining Netscape employees. MozillaZine reports on the start of the Mozilla Sunbird standalone calendar project. MozillaZine moves to a new, dedicated server. MozillaZine celebrates five years at the heart of the Mozilla community.